It's foraging time again at The Haven, yay! And I have a secret.... I'm addicted to making jam! I started making jam's and other preserves a few years ago when Mr C brought home a glut of plums from one of his clients. We were never going to eat them all, so this turned out to be my first ever go at making jelly. It's so easy! And as a basic rule of thumb, the quantities are 1kg of jam sugar, 1kg fruit and one litre of water. 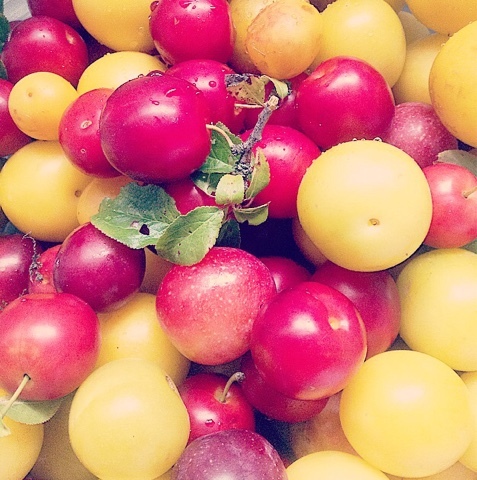 We picked up these lovely mirabelle plums on our walk today, they are my absolute favourite! Here is the recipe I use to make plum jelly. You will need- heavy bottom pan, jam sieve/muslin, large bowl, sterilised jars, saucer kept in fridge or jam thermometer. I take two days to make this jelly. Firstly wash and stone the fruit and put in the pan, then add the water, bring to a rolling boil then simmer for ten minutes, mush the fruit with a potato masher then turn off the heat and leave to infuse and cool. When cold, pour through the muslin over a large bowl, don't squeeze the fruit through as you will end up with cloudy jelly, just let it drip ( I leave it overnight). Secondly have your jars sterilised. Pop them in the dishwasher on hot, or use boiling water or a sterilising tablet. Put the clear plum water back into a heavy pan and add the sugar, heat slowly whilst stirring till all the sugar has dissolved then turn up the heat to a rolling boil. If you have a jam thermometer, pop it in, it will show you the setting point when it comes up to temperature. If you don't have a thermometer (although I recommend you do), you can use the cold saucer method. Spoon some jelly mix onto the saucer and pop back in the fridge for a minute, if the jelly is ready it will wrinkle when pushed, if not, keep boiling till you get there. In the beginning (when I didn't have a thermometer) I got used to the look of the jelly, I'd boil it then reduce the temperature, then boil again until I noticed it had turned into a syrup like consistency. Just remember to never leave it! And it is uber melting hot so do not dunk your finger in it. And if at first you don't succeed, try again!